For some reason I am always drawn to lace. Especially a soft white or cream lace. I guess because it is just soft and feminine and I really feel comfortable wearing it. And this dress is no exception. It is one of my favorites and it is only $48! Such a steal. It can be dressed up or down very easily. It would be cute with flats as well. These New Steve Madden shoes are my favorite. I don't know why but they are really comfortable. I just love everything about them and I highly recommend them. Ann Taylor is having a huge Cyber Spring sale until tonight at midnight. You can get 50% off of your entire purchase plus free shipping. Just use code Cyber50 at checkout. They have so m any cute things for spring and summer. Love this lace dress!! Such lovely photos!! love the soft colors of the outfit! beautiful dress! 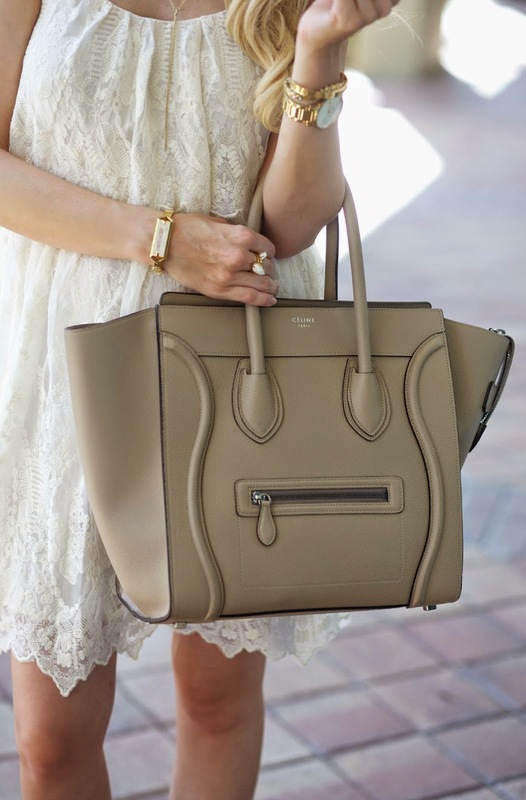 love the neutral details! Always dressed to perfection and looking great! I like your dress and bag very much. Beautiful dress!! You look fabulous. That dress is stunning - and THAT BAG! Love it! http://trendkeeper.me .. HOW TO use your phone for blog photos! Gorgeous dress! I love lace! Looks gorgeous. Question, do you really wear those heels all day with a baby? If so, you are my hero! I am always gravitating toward white/cream lace dresses too! I love this one! Looks so pretty on you! Such a pretty lace dress and love how the layered necklace adds a chic vibe to the look! Beautiful ankle strap sandals too! Gorgeous so light and summer chic all the pieces! Totally need that dress! What a steal! That dress is gorgeous. I love it. I must find a dress similar.